The final two explosive space adventures in the Serrano series, CHANGE OF COMMAND and AGAINST THE ODDS, now available in one great value package.CHANGE OF COMMAND: The Speaker of the Grand Council has been assassinated, and battle lines are quickly drawn. Factions include Families keen to control the new political order, and neighbouring states preparing to defend themselves. Even Fleet can no longer be depended on to keep the peace. Young Fleet officers Esmay and Barin want simply to marry. But Barin is a Serrano, the most influential of Fleet families, and Esmay is Landbride of the planet Altiplano. Their elders see only disaster in the match. And as Esmay and Barin struggle to reconcile their families, their very way of life is threatened.AGAINST THE ODDS: The worst has happened and Fleet is tearing itself apart. Some mutineers see injustice in the unequal spread of rejuvenation drugs offering virtual immortality to the rich; others are simply thirsty for power, or for blood. 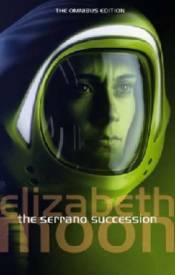 And when Esmay Suiza-Serrano is unceremoniously booted out of Fleet, the apparent victim of Family politics, she has no idea of the whirlwind of conflict that awaits.